Sri Lanka’s South Coast from Yala to Galle is palm-fringed beaches, national parks and jungles. And an endless row of busy Sri Lankan villages along the coast. My last post on our Sri Lanka road trip will show you what the South Coast is like and what is special about it. South Coast has made its own mix of colonial and Sri Lankan cultures and as a holiday destination the south combines tropical sunshine with nature experiences. 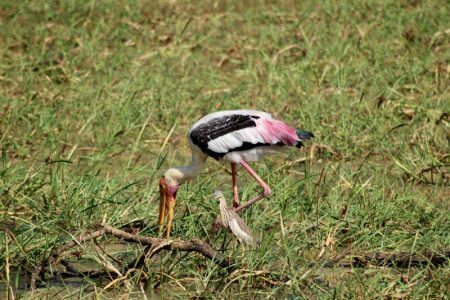 The main sights in Sri Lanka’s south are Yala, Sri Lanka’s number one national park and Galle, a Dutch fort – and the vast expanse of white beaches between Yala and Galle. Sri Lanka’s South Coast is a tourist coast but much less packed than what it is closer to Colombo. The 2004 tsunami hit the south very hard and still today lots of rebuilding is going on. Destroyed villages, roads and rail lines are back and new small-scale hotels appear on the beaches. The country is building an infrastructure of motorways and airports to make the south easier to reach. So tourism to Sri Lanka’s south coast is going to grow a lot in the future. Yet today the south is still a new, fresh and original tourist area – so go there and enjoy your trip, like we did! This post is a visual tour of Sri Lanka’s South Coast. The map shows the parts of Sri Lanka’s South Coast this post covers. We came down from the Hill Country to Tissamaharama and followed the coast to Galle. And from Galle we went on to Colombo. Tissamaharama was our first base, mainly for Yala National Park that is only 30 km away. After a day in Yala we followed the coast through Bundala National Park towards the tourist coast where we stayed in Ahangama close e to Galle. As we already know driving in Sri Lanka ALWAYS takes a lot of time and the South Coast is no exception. Traffic was very slow in South Coast’s western part where we mainly used smaller roads through villages while in east we partly used the motorway. So coming from the north we first came to Tissamaharama. The scenery is completely flat here compared to the tea country we came from but the region has some beautiful lakes. The biggest lakes are Tissawewa and Wirawila that you can see from the main road. I would say these lakes are natural but no, they are man made, 2300 years ago by the king of Ruhuna that ruled here. Tissamaharama used to be the ancient capital of the south and the lakes were needed to grow rice on the fields. You can see some rice fields and an old rice storage on the photos. So Tissamaharama is a historic town which you can also tell from the huge pagodas. The lakes are linked by old irrigation canals that local people swim in. Tissamahara has a lot of hotels since there are many visitors. People come here for the national parks: Uda Walawe in the north and Bundala in the west and Yala in the east. We too stayed a night here. I’m going to tell about our hotel at the end of this post. Sri Lanka has more than 20 national parks of which Yala is the most famous. Yala has a wide scale of nature, from jungle and woodland to dry savannah. The park also has a long coastline that like all South Coast was hit by the 2004 tsunami. However the wild Yala animals sensed the danger before it came and escaped to safer areas. Most Yala animals survived the massive wave and that’s why we can enjoy Yala’s rich fauna today. What Yala is most famous for are the leopards. Yala National Park has the densest leopard population anywhere in the world. That’s because the park has a huge number of spotted deer that leopards need for food. Leopards are in threat all over the world. There’s no natural place for them after farming has increased and needs land. This happens all over the world including Sri Lanka. Leopards only survive in national parks and wildlife reserves. We saw a lot of deer everywhere but not a single leopard. Not even when our jeep driver kept circling and circling around places where they normally are. Of course leopards are night animals that don’t move a lot at daytime. At daytime you should see them sleep in trees but we didn’t see sleeping leopards either. Instead we saw a lot of other animals. Elephants are a lot easier to spot and we saw an elephant family eating grass. And we also saw an elephant mother crossing a small lake with her cute elephant baby. Majestic Yala elephants were so nice to look at! Later on we were driving through Bundala National Park and saw more elephants. To visit Yala you have to take a jeep safari and stay in the jeep at all times. There are many safari tour operators in Tissamaharama and a tour includes a driver who can guide. 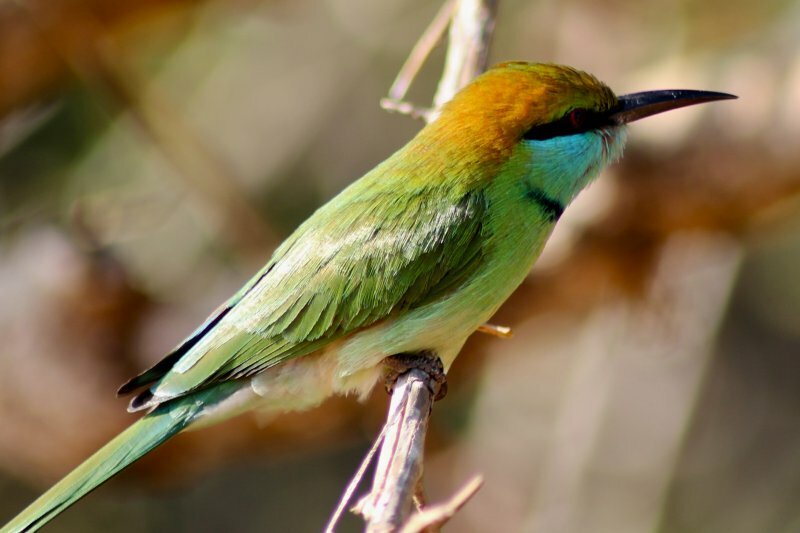 Most people go in the morning or in late afternoon when the animals are most active. You can also stay the night in Yala in a tent. There are some tent hotels that I don’t know more about. That would be a great thing to try and maybe there would be a chance to meet leopards too. What else did we see in Yala? A lot of wildlife. Crocodiles, buffaloes, wild boars, monkeys and more deer. Towards the end of the day the animals got more active. These buffaloes kept swimming in a circle which looked funny. Wonder what the idea was? Peacock is Sri Lanka’s national bird and Yala has a lot of them as well. Then we saw different kinds of storks, some of which were pink, and parrots in different colors. And hornbills in their treetop nests. On Sri Lanka’s South Coast you can’t avoid views of sandy beaches. Sri Lanka’s South Coast is made of beaches, white (or reddish) sand and green palms. That’s what we saw most. Beautiful beaches that for us Europeans look like a paradise. And to catch fish they use fishing boats, but not always. They also fish just sitting on poles. They sit still on their pole waiting for the fish to come. A funny old way of fishing and definitely not an easy one. In this part of the country they used to fish this way until the tsunami came. The tsunami changed the coastline and fishing waters from what they used to be and the old habit didn’t work anymore. Now the fish are back on the coral reefs and the men are back on their poles. You can only see this on Sri Lanka’s South Coast and along the 30 km stretch between Weligama and Unawatuna. The fisherman sits on a cross bar that’s tied to a pole that stands in shallow water just a few meters offshore. He casts his line out to the sea and waits. Visibility in these crystal-clear waters is good and they really get a fish now and then. Coral reefs just offshore typically have a lot of fish. The point is that the fisherman sits high up on the pole and only casts minimal shadow on the water. That makes the fish dare to come closer. Fishing from a pole needs balance and skill and I can appreciate stilt fishing now that I’ve seen it done. Stilt fishing a thing I’ve never seen before and will never see unless I one day return to the south of Sri Lanka. What else are they doing on Sri Lanka’s South Coast? They grow and sell fruit. While the Hill Country is ideal for growing tea and vegetables like onions, cabbage and tomatoes, only tropical fruits grow on the South Coast. You can see bananas, pineapple, melon, coconut, avocado, mango, papaya, passion fruit, carambola, pomegranate, guava and rambutan in street stalls along the highway. They are so fresh and tasty, and why not? They are just picked. And they also grow more exotic sorts like jakfruit, jambu, sugar apple, sapodilla, breadfruit, atemoya and mangostin. We had most of these exotic fruits on our hotel breakfast buffets. They are served everywhere and they are so good…. People is Sri Lanka are so lucky. They can pick so many different fruits year round! As Sri Lanka’s South Coast is a tourist area they also sell souvenirs on the roadside. And they sell a local specialty, curd with honey. Like elsewhere in South east Asia Sri Lankans make curd from the milk of water buffalo. That is like white yogurt but very thick and fat and contains a lot of protein. We had curd many times in Sri Lanka and it’s really good as a dessert. And we always had it with honey that is not just any honey. It’s palm honey from coconut trees. Palm honey very much reminds of maple syrup. They normally make and sell curd and honey in clay pots. You can see those brown clay pots everywhere. Curd and honey, a top dessert of Sri Lanka! Curd and honey on the plate looks like this. And it’s super tasty! Sri Lanka’s South Coast is dotted with temples and monuments of all Sri Lanka’s four religions. What we saw most were Buddhist temples some of which had temple elephants. They use elephant statues and carvings in temples but they also have living elephants on temple yards. I prefer elephants in the wild. But this one is at least getting a shower to make him feel better on a hot day. The drive from Yala to Galle goes through a hundred villages. That’s what it felt like on the back seat. A lot of traffic and people crossing the street, both locals and tourists. Motorbikes, tuk tuks, cars, buses and trucks – and stray dogs in between. These dogs are everywhere and they can behave in the traffic. If they didn’t there would be no dogs left. But before showing you Galle I still have to return to the tsunami. On Sri Lanka’s South Coast you can still see traces of the tsunami, almost everywhere. Like this kind of broken palms. These palms have seen a lot, both good and bad days. If they only could tell us about what happened on that specific day. In fact these photos are from a village behind Galle, a bit north of Hikkaduwa. One of the villages that was most tragically hit has two tsunami memorials. There is both a huge Buddha statue and a train monument. 1270 people were killed in a train that happened to come right when the big wave occurred. The wave was the size of coconut trees and took houses, railway tracks – and the arriving train with all its passengers. In all 50 000 people lost their lives in Sri Lanka and thousands more disappeared. I just had to stop in this place and think about how much suffering there has been. But after every disaster life always wins. The paradise island is building its future and needs tourism. Yet the coastline has one community that didn’t take much damage of the tsunami. 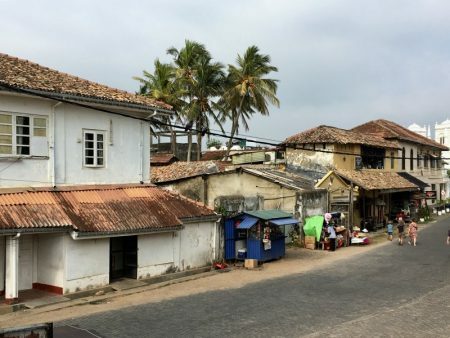 It’s the historic old part of Galle. Galle is an old town built by the Dutch and it has massive walls all around it. These walls have protected Galle so well that it is the best preserved colonial town on the whole island. In fact Galle has a long history already before the Dutch time. First came the Arabs, then the Portuguese, then the Dutch and after them the British. The Dutch stayed for a long time and have built most of the city and the stone wall. And later on the British added 14 forts and the ramparts to the wall. Today Galle is a UNESCO World Heritage Site. It is very pretty with its narrow streets with Dutch villas, fine colonial buildings and European cafes and shops. We had been touring Sri Lanka for two weeks and Galle was the place where we ended our trip. Galle is perfect for that. It’s so different from all other cities we went to. And in Galle it was easier to accept that we were going back to Europe. Galle has a Dutch church Groote Kirk, a Clan house and a Government house, an old warehouse, a Dutch bell tower, a lighthouse and a mosque that looks like a Christian church. There are many museums and some nice hotels inside the walls. And the harbor has some lovely restaurants. The ice cream photo is from one of those restaurants. But Galle is not just a historic Dutch town and definitely not a museum, it’s a living Sri Lankan city with local Sri Lankan happenings. There is a lot of local culture and art as well. We happened to see local school children training for a dance performance in front of a stupa. We first stayed at Tissamaharama that is a good choice in the east. The village is close to the main south coast sight Yala National Park and that’s why the village has a lot of accommodation. Our travel agent had booked us into Tamarind Tree Hotel in the village area. We also visited another hotel for lunch, Kithala Resort. Sri Lanka is a country where restaurant standards vary and it’s hard to know what you will get. So a hotel lunch is always a good choice. This is Tamarind Tree Hotel, Tissamaharama. Not bad at all, or what do you think? The hotel has clean white buildings around a fantastic pool. And the pool is dark blue. They also have an open dining area with no walls on any sides which is good in tropics, and the entrance hall is the same way. You don’t need that much walls in the tropics and you can hear the birds better. Yet no mosquitoes were bothering us while sitting out. So we sat outdoors and dined the whole evening. The chef was standing behind his barbecue and kept asking what we wanted so we spent a long while enjoying with his grilled seafood. But at daytime we did something else. We spent time around the fantastic pool literally five steps from our door. What would be better? Here is Clas wondering if he should take a dip before our Yala jeep comes. We were going to Yala in half an hour and the camera was ready and packed. We had a lovely time at Tamarind Tree and I think there were tamarind trees too, I’m not really good at tropical trees. At least there were palms. Here is a link to Hotel Tamarind Tree website. But Tamarind Tree was not the only Tissamaharama hotel I have experience of. I also have to mention the new, clean safari style Theme Resorts hotel since this hotel has a very good service and at least excellent lunches. This time we took international portions and all hotel guests seemed to be international as well. Probably all of them were going to Yala. Insight Resort was right on the beach so no long walk was needed to warm tropical waters. Our balcony faced the Indian Ocean and we could hear the sea at night, a thing that always makes me sleep well. And what about breakfast on the sands… This hotel lets you choose where you have your meals, in the air conditioned interior or out on the beach. It was our last morning in Sri Lanka and nothing could beat a outdoor breakfast on the beach. It looks like this was a hotel popular with British travelers, there were many of them which made me feel a bit like home. And I will be that, tomorrow morning at 9 and will definitely not have my breakfast outdoors. Leaving Insight Resort meant leaving Sri Lanka’s South Coast. We had traveled a long way and I was not like this happiest person when checking out. We were going home. We traveled 1600 km in all including all small side trips we made. Our driver Mac was two weeks with us: driving, taking care of us, finding all the attractions and the hotels. There were ten different hotels. He was busy and efficient, he worked full time – and we took it easy. We had no concerns, everything was already planned. Mac works for Connaissance de Ceylan, a local a travel agent that arranged our trip. They have a wonderful team that are professional in creating great travel plans. They know their country and what other travelers have liked and what doesn’t work. I’m so happy that local experts planned our trip. The normal is that I plan all my trips from the scratch, you know how it goes. I book flights somewhere that sounds like a nice place. I haven’t been there so I have to start searching for information and reading blogs like mine. And finally I know roughly what to expect and can plan my trip and make the bookings. But you will never know everything and there will be surprises. That’s the normal but this trip was different. I tried a trip with everything planned by others than myself- and liked it! Maybe I have to start making more of this kind of trips. Planning takes so much time. Good bye Sri Lanka, waiting to see you again! In these two weeks we learned to love this little Indian Ocean island, only 200 km wide and 400 km long, located 600 km from equator and 50 km from India. The little island offers so much and my Sri Lanka posts all together cover what we saw. You can find my all posts on Sri Lanka on the Sri Lanka category page. I explained our whole itinerary in the main post What to See in Sri Lanka.